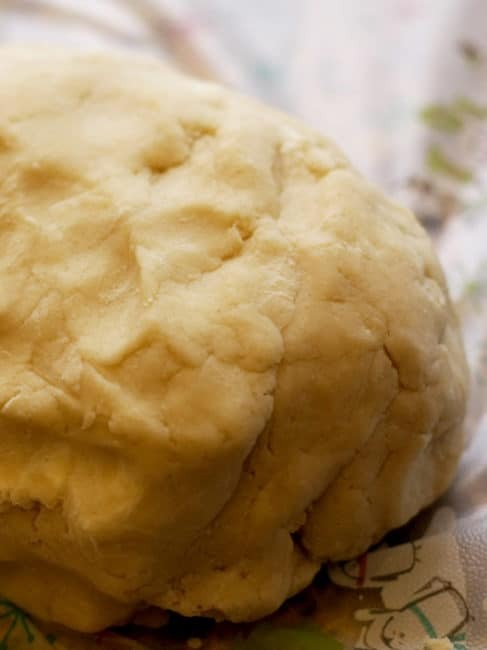 Do you cringe at the thought of making your own pie dough? Do you run for the frozen aisle of the grocery to grab pre-made pie crusts for the freezer just in case? Relax. Read this post and your fears will wash away and you’ll be beaming like a proud baker as your guests enjoy your fabulous homemade pies. Acrophobia, claustrophobia, doughaphobia. I have successfully faced the demons of the first two phobias but am embarrassed to admit that until I started writing this blog, I was doughaphobic. I’ve alluded to this debilitating anxiety in previous posts (How Did Bubbe Bake It – Part 1) and now feel that I must face this phobia head on. But not alone. No, Cheryl Sternman Rule of the witty and wonderful blog 5 Second Rule and my very own dormant chef (aka hubby) have been right by my side either literally or figuratively. I am happy to share with you today that while I am not cured, I have faced the pie crust and did not let it crumble me. 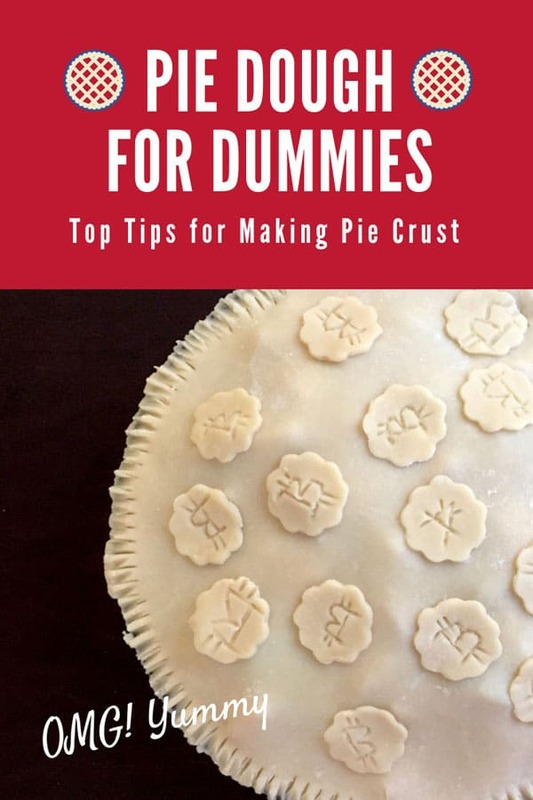 So for all of you who dial the emergency Marie Callender’s 911PIE number instead of creating your own pie at home, here are the top tips for pie dough novices and those suffering from an acute case of doughaphobia. 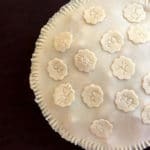 If you have been asked to bake pies for a holiday dinner and haven’t slept since the request came in, read this post. You can do it. 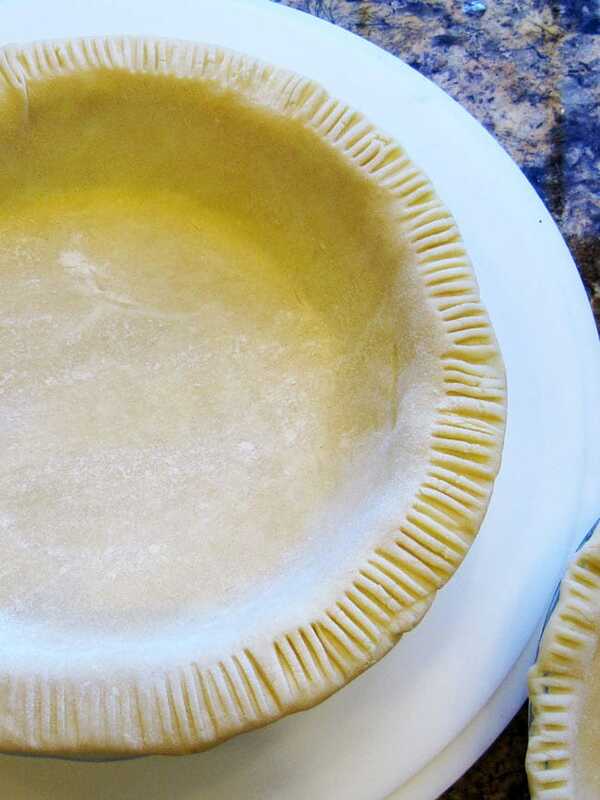 For those of you who are pie crust experts already, please just head straight to the comments section and leave us your favorite tip or words of encouragement. It’s part of our 10-step plan to beat this lingering fear. 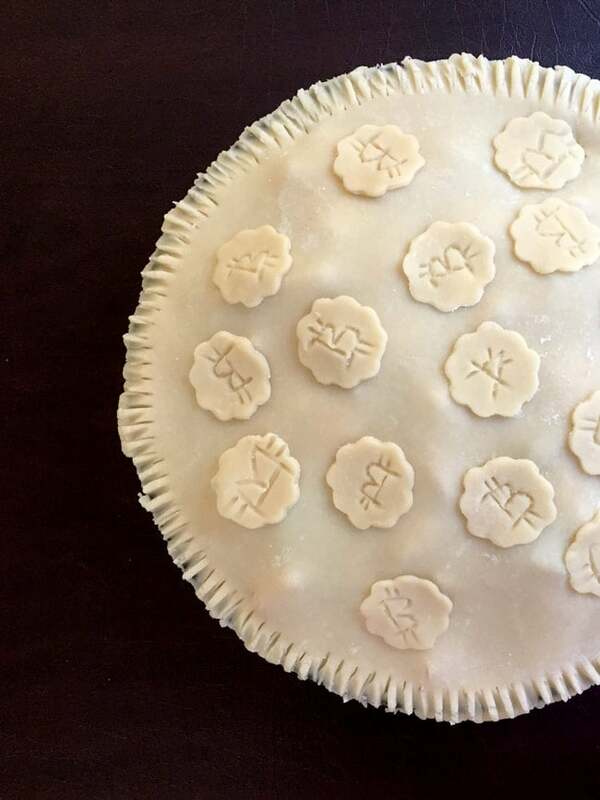 Apple pie decorated with bitcoins on top – another reason to get over your fear of pie dough! 1. 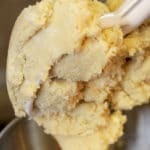 Can I make the dough a day before and refrigerate it? Cheryl says: Absolutely! You can even make them the weekend before, roll the crust out, line the 9-inch glass pie plate with it (do not deviate here — make sure it’s 9-inches*, and shallow, and glass. The cheap Pyrex ones from the supermarket are fine! ), then wrap it in a double layer of plastic/foil and freeze the whole crust/plate combo. You might put a piece of parchment on the dough so the foil doesn’t stick. Take it out of the freezer the night before and put the whole thing in the fridge to temper the glass so you’re not putting a rock-solid frozen pie crust and plate directly into a hot oven. OR, just make the dough a day or two before, refrigerate it, and roll out and bake it the day you need the pies. 2. Is there any need to pre-cook the pie crust? 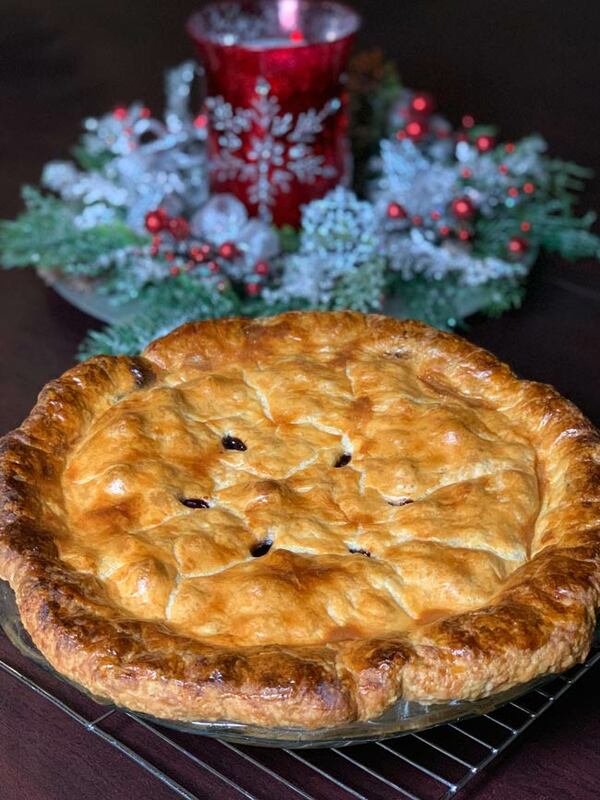 Cheryl says: Many pie crusts do have to be “blind-baked” – in other words, par-baked with nothing but heavy beans or pie weights before you add the filling. Cheryl’s pumpkin pie does not. To ensure a properly baked crust, bake it on the bottom rack of the oven. The lowest one! The glass pie plate ensures thorough baking, too. Do not deviate, or you will be punished. (I deviated – read on). Check the pie about 15 minutes before it’s scheduled to come out, and cover the edges with a little foil if they’re getting too dark. 3. If refrigerated overnight, how long should the dough sit out of the fridge before you roll it out? Cheryl says: If the dough is too hard to roll, it’s too hard to roll. That sounds stupid but it’s true. If you’re in a hurry, whack it with your rolling pin to make it malleable enough to roll out. Or just leave it at room temp for just a few minutes. 4. Where should I roll out my dough? Roll out your dough on a very well-floured countertop or board, then use a pastry brush to lightly brush off excess flour before you place it in the pie dish. 5. 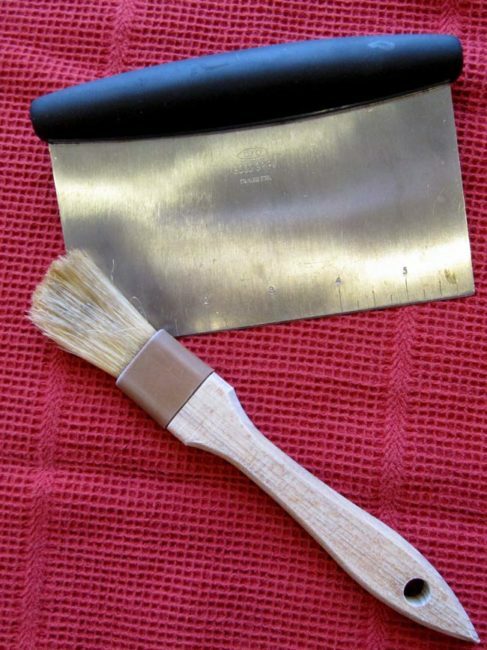 What tools do I need to prepare my pie crust? Invest in a bench scraper if you don’t have one. They’re cheap. It will help you move your dough around or cut your dough in half, etc. To buy the book, click here . Give it a try yourself (repeating the word COURAGE the whole time). 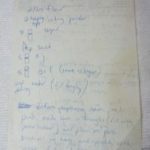 Here are some useful tips I learned when I made the first two batches of dough. 1. 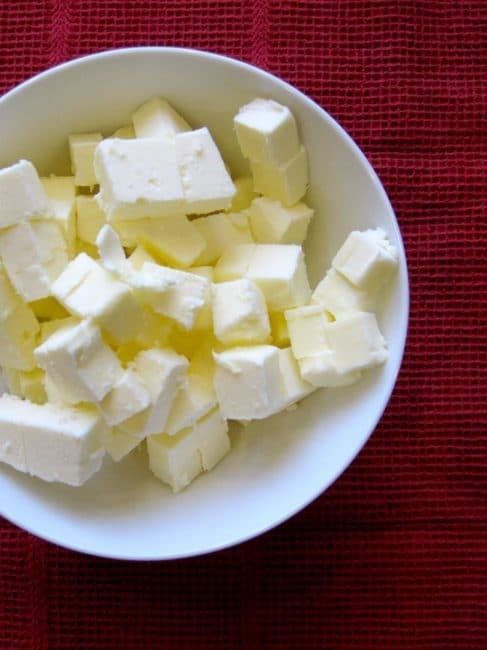 Cut up butter ahead of time and put in fridge so it’s ready to go. Using chopsticks to put the butter in the mixer works great if you know how to use them. 2. Have ice water ready before you start the mixer. 3. 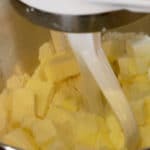 Do not take eyes off mixer once you put butter in – the transformation into pea-sized pieces happens all of a sudden – you can hear a change in the sound of the mixer as the transformation is about to happen. So stand by the mixer and watch and listen! 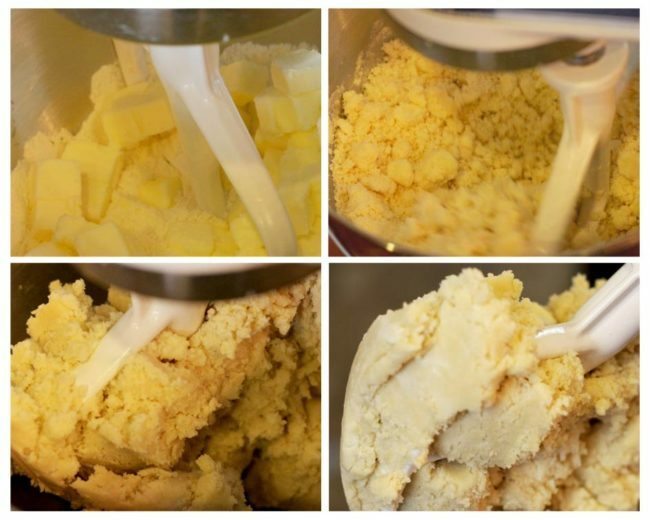 Stages of pie dough in mixer: 1. cubes of butter added; 2. pea-sized pieces forming; 3. water added and incorporated; 4. finished dough! 4. The 10 seconds in the recipe to mix in the water is very precise. 5. When you form the dough into a 5-inch disk to refrigerate, don’t work dough, just roughly form it and get it in the fridge. The one step you could add is to separate the dough into two disks either by eyeballing it or weighing it if you have a kitchen scale. Then you are ready to roll out your top and bottom crust once the pie dough has rested. 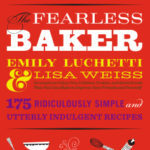 I hope baring my baking soul and revealing my phobia will give more of you courage to try this yourself at home. And when you do, let me know of your success because really, if I can do it, you can too! *Note about the the 9” glass pie dish: Depth and diameter matter! Turns out that it was not easy to buy the 9″ Pyrex pie pans around Thanksgiving. I went to 5 stores – 2 Targets, Nob Hill, Safeway, and WalMart. All the individual glass pie plates were 9.5″. But what’s even more important is the depth of the pie pan. So my first purchase at Target was a 2-pack of 9.5″ pie dishes that are deeper than normal. A deep dish pan requires more filling and possibly more dough. With practice, these details will be second nature. Have no fear! This classic butter-based pie dough by Emily Luchetti from her book Classic Stars Desserts has been my go-to since 2010. It has never failed me and is always easy to handle. I hope you love it as much as I do. The first thing I do (can even be earlier in the day) is to cut up the butter, put it in a bowl and keep it in the refrigerator ready to go. I also make the ice water ready. Using your stand mixer fitted with the paddle attachment, place the flour, sugar, and salt in the bowl and mix it together briefly on low speed. On low speed, mix the flour and butter together until they resemble small uneven size peas. 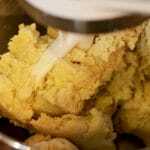 If you listen while the mixer is working, you will hear it change tone as the butter becomes incorporated into the flour. At small pea stage, add in 3.5 tablespoons of the ice water and mix for 10 more seconds. Then take a small bit in your fingers and squish it. Does it hold together? Then you probably added enough water. Is it a bit crumbly? Add in another tablespoon of the ice water. When it is one nice ball, remove it to a lightly floured surface. If you want, you can split it in two now, wrap each piece separately (one for the top crust, one for the bottom crust). You can even weigh them out to be precise if you’d like. 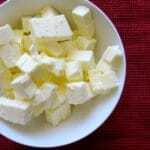 Wrap them well and place in the refrigerator to rest for at least an hour before you roll them out. You can also leave them refrigerated overnight or you can roll them out, line pie pans with them and freeze the whole pie-crust-lined pie pan for later use! Wait till they are pea sized, then add that bit of water and watch the magic happen! This is very informative and helpful for a dammie like me. Thank you! Haha – Glad to be of service!!! So much great information here, Beth! This is a great one-stop reference post for all things pie dough! Not that the queen of desperation pies and all things baking and pastry needs any help!!! I love how you break it all down step by step…thank you so much for this!! I learned from the best :-). Glad you find it helpful! after struggling for so long to create really tasty flaky pie crust, an accident was a big help.The recipe called for 2 tbsp water and 1 tbsp cider vinegar. Due to my unsteady hand it ended up being 1 tbsp water and 2 cider vinegar. I also learned that before chilling the dough I form it into 2 discs wrap and chill which makes the dough so much easier to roll out. Yes to all of the above! I’ve heard vinegar or vodka can be a great addition. So glad you found your formula. And thanks for sharing the great tips! Such great tips, Beth! I go between my olive oil pie crust recipe and a butter based one. But even after making a few pies, I still get little doughaphobic when I’m about to make and bake a pie! Your tips should help me the next time I break out the pie pans! Thanks Laura – I need to try your olive oil recipe. I made an olive oil crust a couple weekends ago for a chicken pot pie and it wasn’t great. But I know it could be with a good recipe! 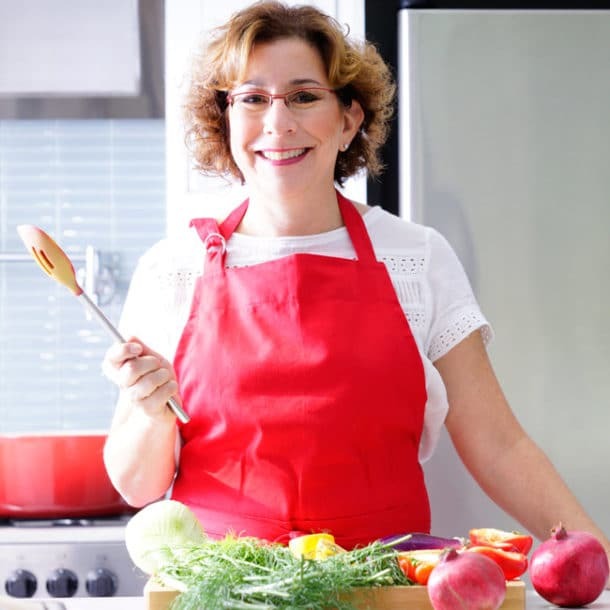 It’s my pleasure – I love helping people feel comfortable in the kitchen! These are really helpful tips! I’ve never felt like making pie crust was hard, per se….but sometimes when I make it, it comes out really well and other times not so much, lol. This is going to be really useful! You know it really isn’t hard – but in our minds we make it so don’t we? I love the title of this post…it describes me to a T. Your tips are so helpful, I can’t wait to give this a try. Thx Sandi! We are just 2 peas in a pod!! Amazing! Thank you very much! I will let you know how I get on. Thanks very much, Beth! I appreciate the recipe. If I am using that dough to make an apple pie – I really really don’t have to blind bake it? He Beth, My pie dough is still like a rock after sitting on the counter for the last half hour. What should I do. By the way I’m making my first attempt at pear,apple, cranberry pie. Hi Mike – my friend Cheryl told me not to be afraid of it – she would grab her rolling pin and pound it a couple of times to get it going. Also your hands have a lot of heat so once you start rolling it, turning it, it is going to warm up. You have to believe! Do you have a recipe for a pumpkin pie filling to go with this lovely dough? 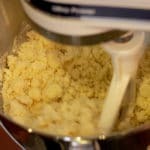 could i just use my fingertips to work the butter/lard instead of the mixer? Yes! In fact many believe a pastry blender or fork or your hands is the best method! Love the tips, but even more so with your story of last minute shopping for a pie plate. That’s me in a nutshell – running around for the one item I should have bought weeks ago:) Have a wonderful holiday. It’s an early post but all the advice holds true! And this post still gets a ton of traffic. Hope it helped! I’m still working on overcoming my ‘fear of baking’. Watching an old Julia Child & Co. rerun this summer (on PBS for Julia’s 100th birthday) on making a French Apple Tart (not to be confused with a Tarte Tatin) I became inspired. I bought myself a hand-made maple French rolling pin and felt empowered. We grew and harvested our own apples for the applesauce base and sliced apple topping. I found a ‘butter-free’ pie crust recipe on Epicurious using beer, oil and baking powder that was workable (with the addition of small amounts of salt & sugar). I repeated, in French of course, “Courage” and… “Voila”, a tart I was proud to serve! Hi Kris – So glad you stopped by and what a great story! Pie dough w beer and oil and baking powder and you made it work. Though after taking the tour of the North End w you and hearing your endless food knowledge, I am not surprised. 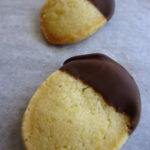 But there is just something about baking that is a bit daunting, even for those of us skilled in savory preparation. The more you try, the less scary it becomes. I just wish I had more time to practice. I just started reading “Dearie” – the biography of Julia – nice read so far and so fascinating. She is still such an inspiration to so many of us. I grew up watching her on PBS – a strong memory from my childhood. For more inspiration, consider downloading Dorie Greenspan’s cooking app – Baking w Dorie – it’s worth it just for the video of her making a Tarte Tatin (not French Apple Tart). The excitement in her face and voice when she succeeds in taking it out of the pan, is just delightful. She is, by the way, just as lovely in person, as she appears in the videos. Thanks for stopping by – look forward to staying in touch. Glad you could do it. I too doughaphobic! Ain’t that a shame? For me it;s like, why bake it when you can just buy it? Although, truth be told… We all know that there’s nothing like homemade. I need to get 1 of those mixers. Someday. We don’t have the counterspace for it. I’ve never made homemade pie crust. Hey SITStah, thanks for popping by today…loving your blog! And yes I am a doughaphobic but have always wanted to give it a try, with your post maybe I will now..yay..lol. Thanks a lot for the tips, and for the funny post. 🙂 Happy New Year! So glad the tips were helpful and that your foray into the terrifying underbelly of the pie world was a success. Let me know when you’re ready to conquer croquembouche. How did you know I was planning on serving croquembouche for dessert at my daughter’s Bat Mitzvah in February? NOT! But if I ever hallucinate long enough to believe I can create one of those baking works of art, you’ll be the first one I’ll call. Thanks again for all the help. Two Thanksgivings ago, Dennis and I made our very first pie dough. OK, it was more like Dennis made his first pie dough while I watched. I’ve always felt intimidated by it. This year when I made my pumpkin pie from scratch I still asked Dennis to make the dough for me. I’m going to try to bite the bullet and make my own from scratch on Christmas Eve. Wish me luck! Courage, Jun, Courage. In case you didn’t notice the man’s hands in the rugelach post, go take another look and you’ll see that dormant chef is doing all the dough work. I’m still in recovery, not fully recovered. But when we made the pumpkin pies, I really did it all by myself from the mixer to the rolling out. My rolling out was not fabulous but use a lot of flour and then the pastry brush to get the excess off and you’ll be fine. Good luck and report in on your success! Great post offering humor on a potentially fearful topic! I love the Tartine cookbook’s flaky tart dough recipe; it’s been foolproof for me. It uses more water than many recipes but is, indeed, flaky and tender every time. I also prefer a food processor to mixer. Hmmm – food processor. Will give that a try, although I have taken a liking to my mixer of late. It’s located in a great spot in my kitchen on a pull-up shelf and I love pulling it out and putting it back (not a good reason to use it but if it gets me baking, it’s all good). This is the second time today someone has recommended the Tartine book – will have to add that to my list. Thanks for the tips! I’m looking through old posts because I obviously have missed all of the Thanksgiving posts and was thinking about it tonight. I know — I’m weird thinking about Thanksgiving in August. Can’t wait to use both the bread cubes and stock recipes. Love that you’re thinking about Thanksgiving in August. Maybe you should be a food writer :-). 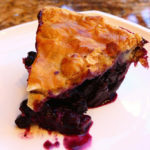 So many variations on pie crust – if you’ve got one that works – don’t mess with it! Love the pre-baked detail – good to know. And great to hear from you!